Last season was the perfect example of how much Arsenal need a better, or at least another striker. Spending is no longer taboo, so it’s not surprising to learn of the team’s interest in Karim Benzema of Real Madrid and if that doesn’t work out they’ll turn their attentions to Mario Mandzukic of Bayern Munich. Olivier Giroud had a good season at best. One of the problems was he didn’t have a suitable backup. Theo Walcott was injured most of the time, Nicklas Bendtner isn’t a serious option off the bench for a team with Arsenal’s aspirations and Yaya Sanogo is young and raw, and it’s not going to be a surprise if he doesn’t last too long with the club. Arsenal needs a striker who can either make more with the chances created for him, and with a talented and creative midfield there’s no reason that won’t happen, or someone who can create on his own. Karim Benzema fits the latter. He enjoyed what might have possibly been his best season with Real Madrid, scoring 17 league goals and 24 in all competitions to go with 15 assists, despite a rough start with plenty of criticism. Arsenal have already signed one star from Real Madrid to mix success in Mesut Ozil. But players always come and go at the Santiago Bernabeu, with things quickly changing in the most demanding club in the world, so the right offer while Real Madrid think of new strikers (Luis Suarez?) to bring in might pave the way for Benzema to set foot in the Premier League, with his price tag estimated at £30 million. 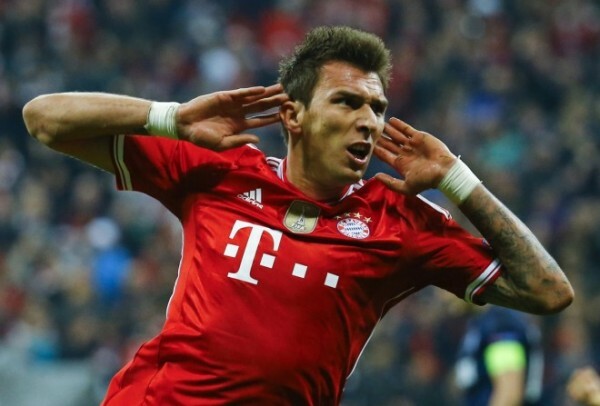 If not Benzema, Mario Mandzukic is another option. The Croatian striker had another productive season for Bayern Munich, scoring 18 league goals and 26 in all competitions. However, Guardiola doesn’t mind playing without strikers and Robert Lewandowski is coming from Dortmund. That might make the 27-year old think once or twice about his future, and look sideways towards other options. He will cost at least £25 million to bring over if Arsenal go in that direction.